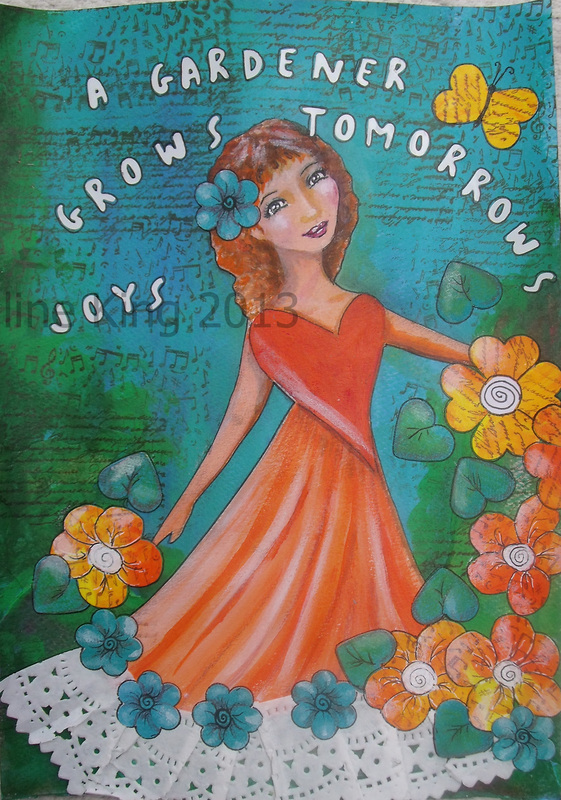 This entry was posted in Creations From My Craft Room, Creativity, Mixed Media, painting and tagged acrylic paint, Color, handmade flowers, Mixed Media, Orange, paper, pens by thecontentedcrafter. Bookmark the permalink. And I hope you find one! I was amazed at the amount of comments from people who didn’t like orange, but loved the painting…….. usually if you don’t like a colour you don’t like what it is attached to. I thought it wasn’t a colour I warmed to, [ha!!] but couldn’t take my eyes off the way the picture fairly glowed at you. Quite so, it will out! What’s your favourite colour? I haven’t logged in for a while, but I am glad I did today. This piece has such joy. The color combination has great contrast. I love the message and the girl. This one is uplifting! Great job! Big hug! The longer I live with her, the more I like her! Isn’t it amazing when that happens! Thank you for those encouraging comments, I appreciate your input so much! This post has become so interesting, finding out how people feel about the colour orange! She is out in my living room, sitting atop the bookshelf [which is, coincidentally, one of Orlando’s preferred resting places]. It is unusual for me to keep a piece out once it is finished – they are usually filed away – but I like her – I like her more every day and I am wondering why. I don’t have the answer yet – dang it all – but suspect I shall be using more of this colour to see what happens. I do have a tube of the most bee-oo-ti-ful magenta – y colour – called ‘rose madder’ – which I adore. I use a little bit in every painting, lips, if nothing else…..I wonder what would happen if I combined the two….. I just did it – had some help from Russell Deasley over at the world’s greatest top 10 – very pleased proud and happy with myself! I had a rose called Happy-Go-Lucky when I lived in Wellington that had those colours. It was stunning – it used to practically pulsate in the late afternoon light in the middle of summer. We’ll have to wait and see if anything comes of the orange and magenta colour palette…. Thanks Linne – she has certainly raised a few thoughts on how we all feel about orange ……… I must try more colours that are not usually found on my palette! You do seem to work fast, I’ll agree, yet every project is so unique. I fancy that you made the leaves heart shaped and so perfect when you’re talking about our favourite gardener. I personally am not an orange lover. The lake house was full of orange and brown when I moved in and I spent the next 5 years eliminating it. Such as orange and brown kitchen, brown orange and gold rug….I’m not even kidding…tres ugly. Your sweet garden makes it so much more palatable though. Orange and aqua are actually very trendy I’ve noticed. Did I mention I bought two giant old books last week? I won’t be a copy cat but I thought of you when I bought them. Oooh, I would have killed for that colour scheme back in 1969! I was a bit ahead of my time but by 1974 it was all the rage …..My, how times and tastes change! I was not aware that orange and aqua are ‘in’…… I don’t think I could live in it or amongst it! Though having said that when designers work with shades and tones, lovely things can happen. I think only LB has said she wears orange and likes it – most others have said they like it in the painting ….. some are like you and me and not lovers of the colour, but most seem to agree that the painting is okay …. My daughter emailed to say she loves it and I know she doesn’t have any orange anywhere! Go figure! The more I look at it the more I like it – I think you are right, it fits the season! I suppose I do work fast – I still struggle with the concept of walking away and leaving something unfinished. If I can see a way through I tend to keep at it. Remember I don’t have anybody else pulling at my time, if I want to work I can. So to you others who have lives, I appear to be waving a wand and producing stuff from thin air…. Ha, I like it! I love the orange in this piece! I like the long “flowy” dress. The hearts in your work make me think of all the beauty and love you share with all your readers. Have a great week, Pauline! Many of the clothes in my closet are orange, it is one of the two team colors for my beloved Hokies (Virginia Tech), and I think this painting is a success!! Yay – at last – an orange lover!! Thank god you’re here!! Go the Holies!! 🙂 Thanks for those kind words too, they mean a lot! I love the orange, Pauline – especially for summer. Your gardener has a very sweet face. I was told in art classes at school many moons ago that “blue and green should never be seen”. Ha! What a load of tosh! Your blues, greens – and oranges and yellows – should always been seen. Your paintings are a delight. Ha, “a load of tosh”…that’s a keeper 😀 You make me smile Dani. I’m glad I stayed up late to see this post! Thanks so much for the mention, Pauline. I love that saying! Truly inspired. She’s a cheerful, carefree gardener. I sense that from the tilt of her head, the swirl of her skirt and the way she scatters flowers all about. I just can’t get over how quickly your mind works and how all the little pieces come together. As for the color orange, it’s never been at the top of my color favorites either (I like green, blue, purple as well), but it’s my son’s favorite color so I set aside my own aversions and have used it sparingly in his room. I continue to enjoy the art piece I bought for my friend E. It will be a sad day when I let her go. I think I was thinking of you as she became a red head and a gardener wearing a huge heart – whats not to link the two of you together? Having had a first go at her I may have another shot a bit later. not necessarily in orange though I actually quite enjoyed working with it – it’s a happy colour! It is a happy colour. LOL on your first comment. You make me smile. I feel I’m surrounded by wonderful art lately: yours, Lexis and others. It’s good for the soul.